Machina Dynamica's latest product, Codename White Poppy, is a wall-mounted room acoustics device that reduces the deleterious effects of standing waves and early reflections; it improves soundstage depth and height, air, dynamics, coherence and reduces distortion. The White Poppy resonator is fine white ceramic, measures 4x4x1/2 inch and is suspended from a tack on the wall with silk thread. "White Poppy resonators, installed in the upper corners of the listening room, opens up the soundstage, raises the image height and, surprisingly, lowers the noise floor, thereby improving intelligibility and reducing grain." "To cut to the chase, once the two wall-mounted acoustic resonators were set up it was as if everyone had left the venue except the musicians and myself. Amazing pinpoint clarity! I got the distinct sense that the soundstage is a bandshell that expands upwards and outwards toward the listener, bringing intimacy to the music. Following instructions for installation, I placed the first resonator at the center of the back wall between my speakers. The 3 different length strings (provided with each resonator for ease of finding the resonator's optimum location) do make a difference. Initially, I used the shortest string to suspend the resonator so it was about 6 feet off the floor and the improvement in sound was immediately apparent. Back-up vocals became more defined and instruments had more individual space. The center stage vocalist was slightly elevated. Switching to the middle length string (thus lowering the position of the resonator on the wall) brought further clarity to the vocals. In fact, I was able to hear an accent on one of the back-up singers and harmonies became more profound. The music from the edges of the soundstage were nearly equal in presence to the music center stage. The third and longest string was not as effective as the second but better than the first. The second resonator was placed directly behind the listening position; again no wall, so the string for this resonator was taped to a window. The results with the second resonator are a little more complicated. With the shortest string, the second resonator did not really seem to contribute anything, perhaps even diminished the overall effect of the first resonator, lending some disorganization where I expected to hear specific instruments. I then moved to the second string which provided some improvement, but it was not altogether positive. But the longest string snapped everything towards perfection! Game over. Each Codename White Poppy resonator comes with a heavy duty tack and several different lengths of white silk thread that provide flexibility in locating the best location on the wall without moving the tack around too much. (See paragraph below for use of SPL meter and test tone in finding optimum locations.) The resonator is first placed 6 feet above the floor on a given wall using the shortest length thread; then, the two longer lengths of thread can be tried to see if lowering the height of the resonator improves the sound. It is recommended that the resonators be used in pairs for reasons of symmetry. Suggested number of resonators per room is 2-6. Prices include three sets of silk thread per resonator and complete instructions. Shipping via USPS Priority Mail additional. The primary suggested locations for the resonators are illustrated in the diagram below. 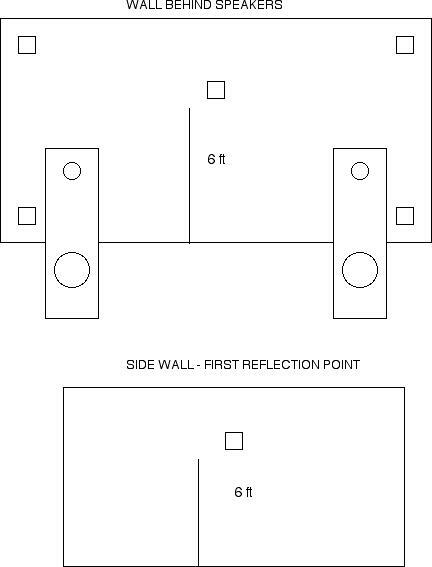 These locations include, but are not limited to, (1) centered on the wall behind the speakers 6 feet high, (2) at first reflection points on the side walls 6 feet high, (3) in upper and lower corners on the wall behind speakers and (4) on the wall directly behind the listener 6 feet high. There may be a great many locations in a given room where placing an acoustic resonator will give positive results. NOTE: The approximate locations show in the diagram below should work very well; however, the most effective method for determining optimum locations for the resonators in a given room is the use of an SPL meter and test tone of 315 Hz or thereabouts - thus establishing precise locations of the sound pressure level peaks in the room. These locations can vary considerably according to room, speaker position, speaker radiation pattern, etc.